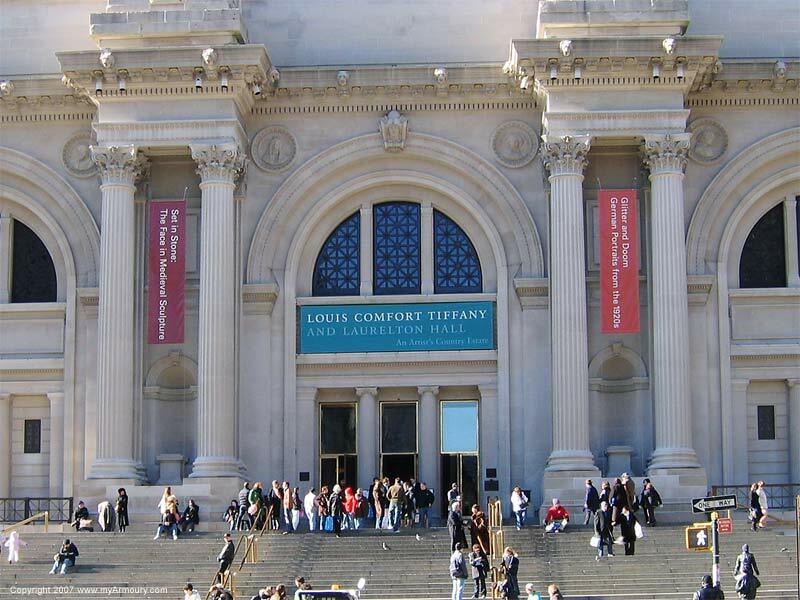 The Metropolitan Museum of Art is one of the most venerable museums in the United States. Formed in 1870, it moved to its current site in 1880. 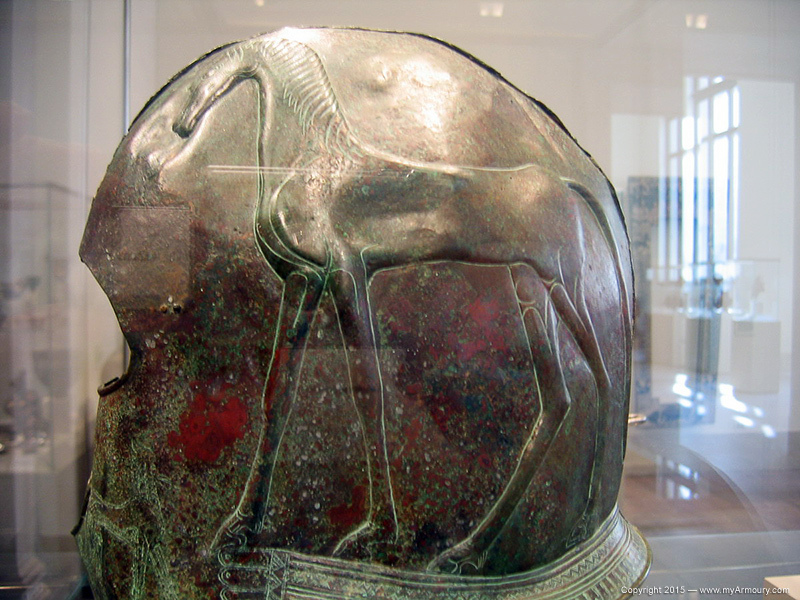 It houses an enormous amount of art and artifacts from throughout history and throughout the world. For visitors to and residents of New York City, it has been a destination for many years. 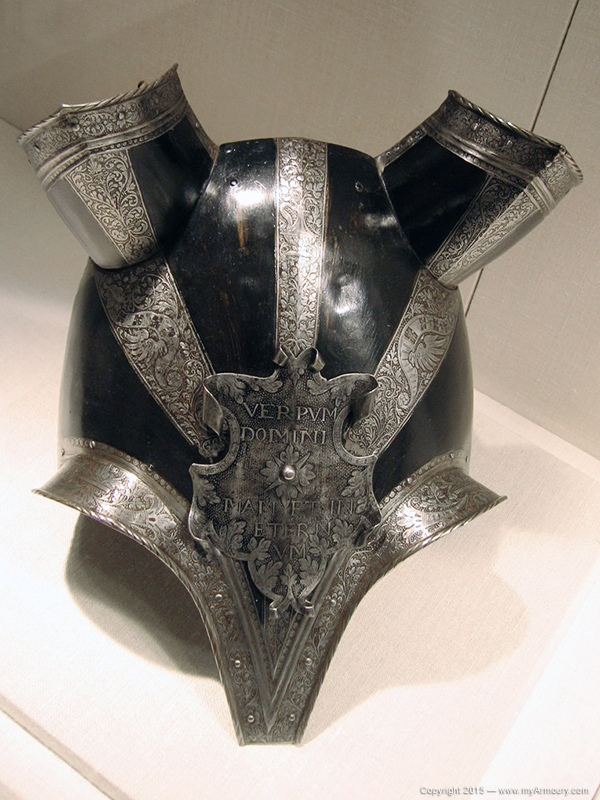 It also houses one of the premiere collections of arms and armour in the United States, if not one of the finest in the world. 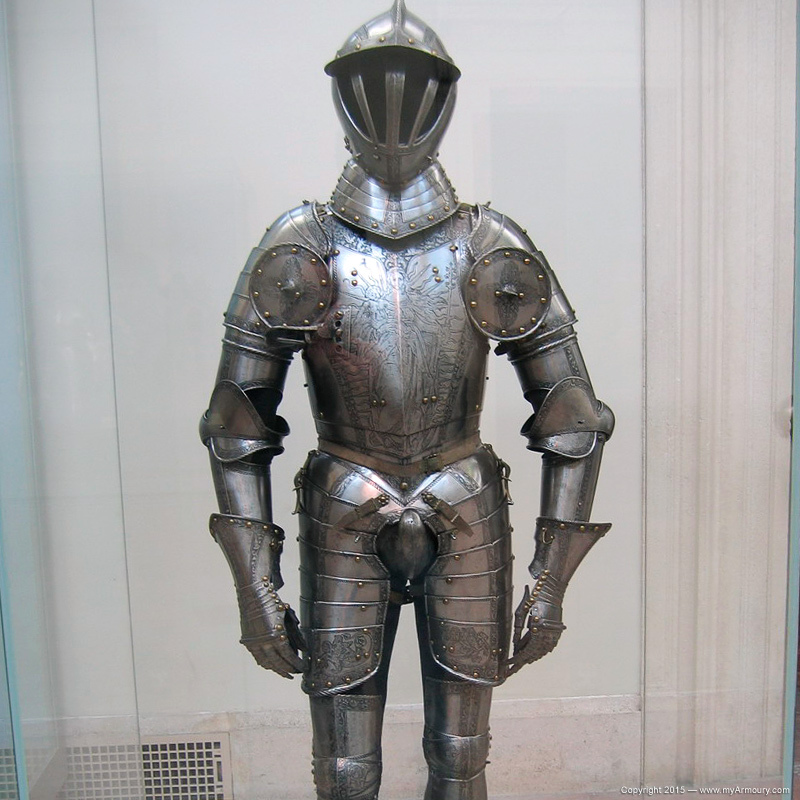 The arms and armour department was founded in 1896 and has grown through the years through purchases and donations. Some of these donations have been entire collections or large parts of them, resulting in a large, diversified, and important larger collection. 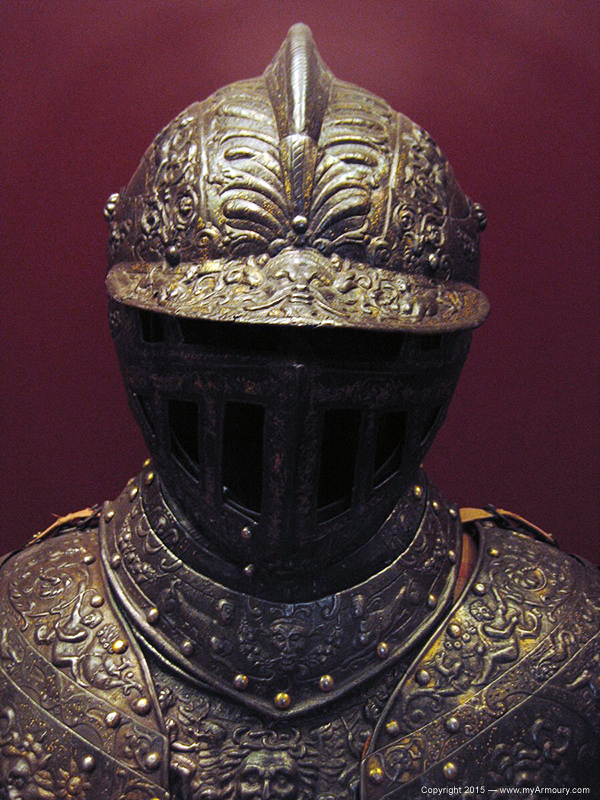 The arms and armour collection's current gallery site was reopened after a renovation in 1991. The Metropolitan Museum of Art (also know as "The Met") is on Manhattan's Upper East Side, in New York's famous Central Park. As such, it is easy to reach it by bus, subway, and taxi. The Met provides suggested donation amounts for entrance: $25 for adults, $17 for senior citizens, and $12 for students. There is no additional charge for special exhibitions, though the museum strongly urges those visiting the special exhibits to pay the full suggested amount. Paying the suggested donation is certainly worth the price in this author's opinion. The museum is open seven days a week from 10:00 to 5:30 Sunday through Thursday and 10:00 to 9:00 Friday and Saturday. All galleries are cleared fifteen minutes prior to closing time. Some amenities allow the visitor to save some time during their visit by taking a meal or snack onsite: the museum has a cafeteria on its lower level that should cater to every visitor. There is also an open courtyard where coffee is served. The Met allows non-flash photography in all of the permanent collection galleries where there are no signs forbidding it. Special exhibitions and items on loan may not be photographed. Use of a tripod is permitted on weekdays with a permit from the desk. For those wanting to take a lot of photographs or who prefers a quiet environment may want to time schedule a visit earlier in the day before the afternoon crowds arrive. 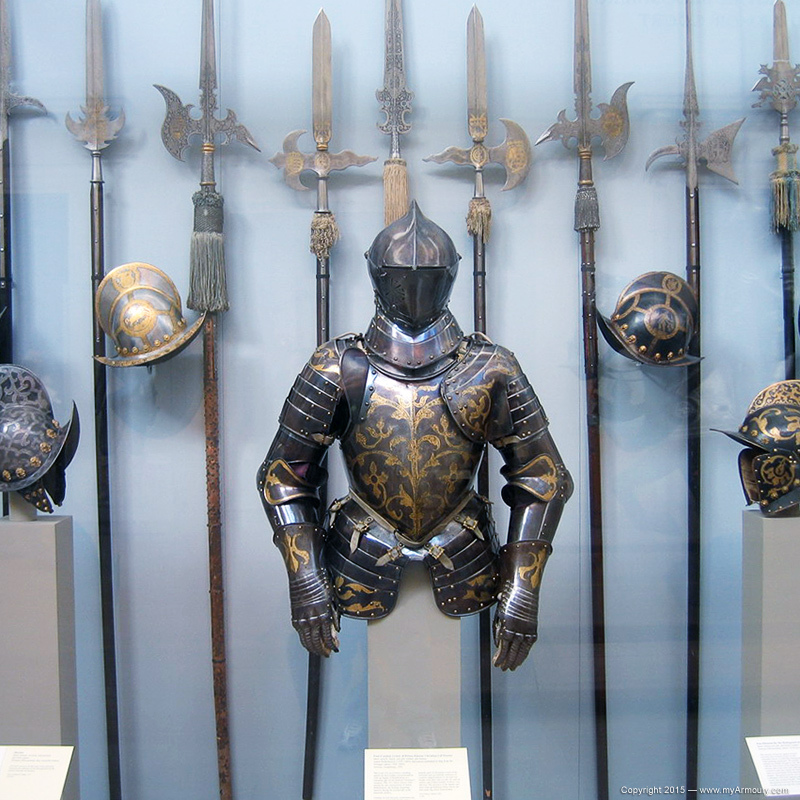 The Met's collection of arms and armour resides primarily in its own section on the museum's first floor. The visitor first walks into the open, largely naturally lit Equestrian Court. This court can also be viewed from above while wandering through the musical instrument exhibit. 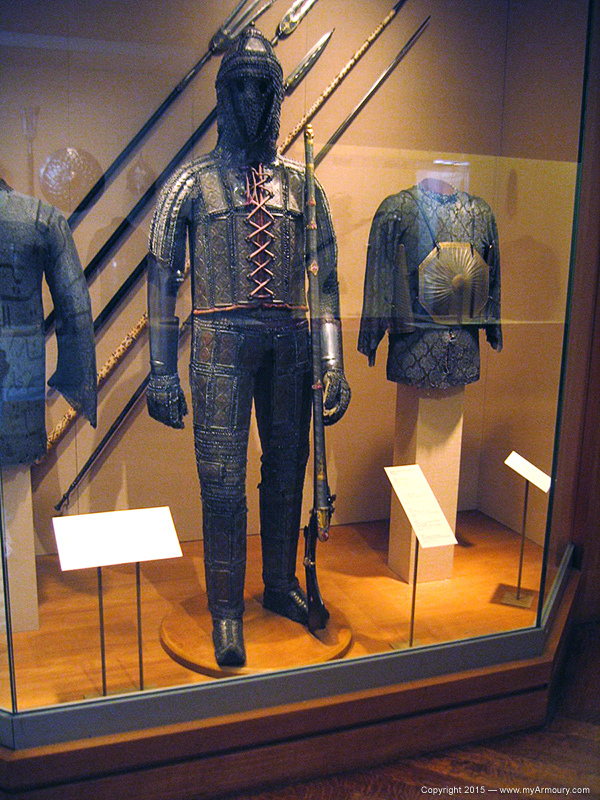 Featured at its center are four harnesses for man and horse, complete with lances. 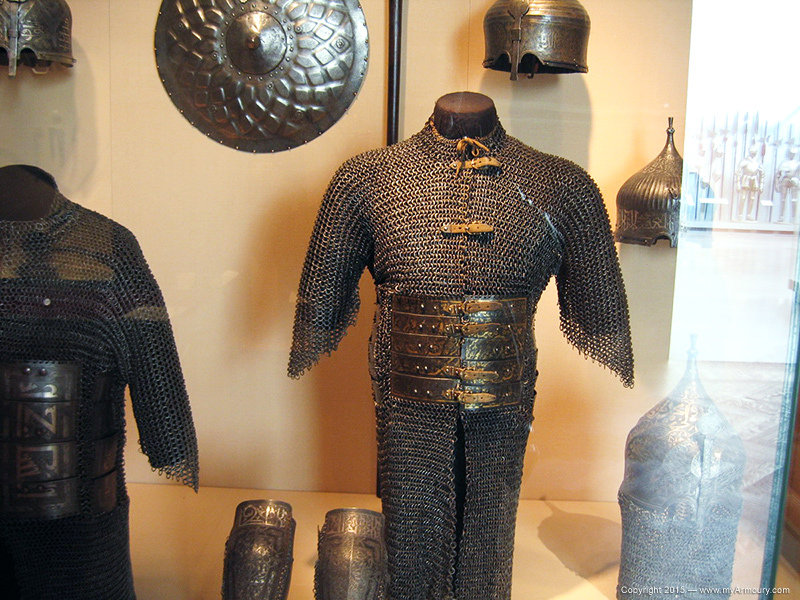 Surrounding this display are case upon case of armour pieces, harnesses, polearms, and edged weapons. Several famous harnesses reside here, including that of Lord George Clifford, Earl of Cumberland. 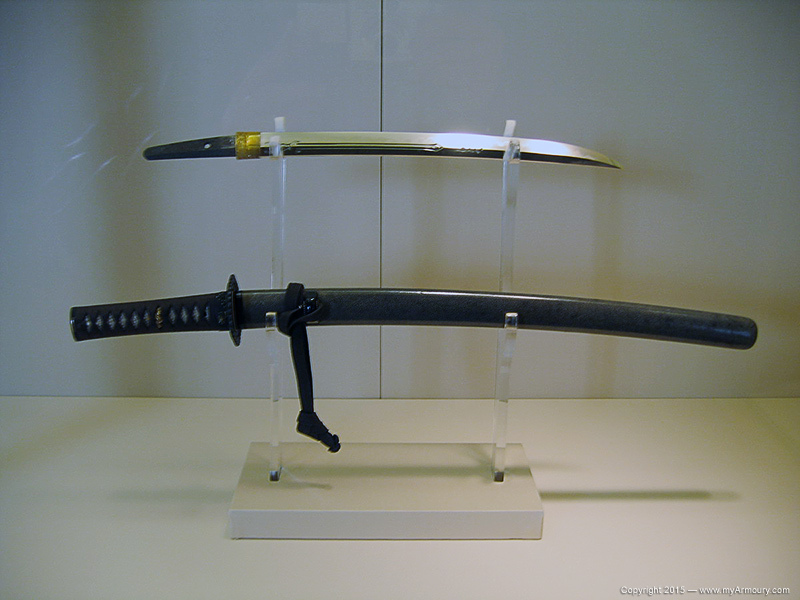 Many of these cases are placed so that visitors can view the item from the side (or sides). The displays often don't feature dark backgrounds and their placement in the central court allows easy viewing and photography. Branching off from the court are interlinking rooms filled with more arms and armour. 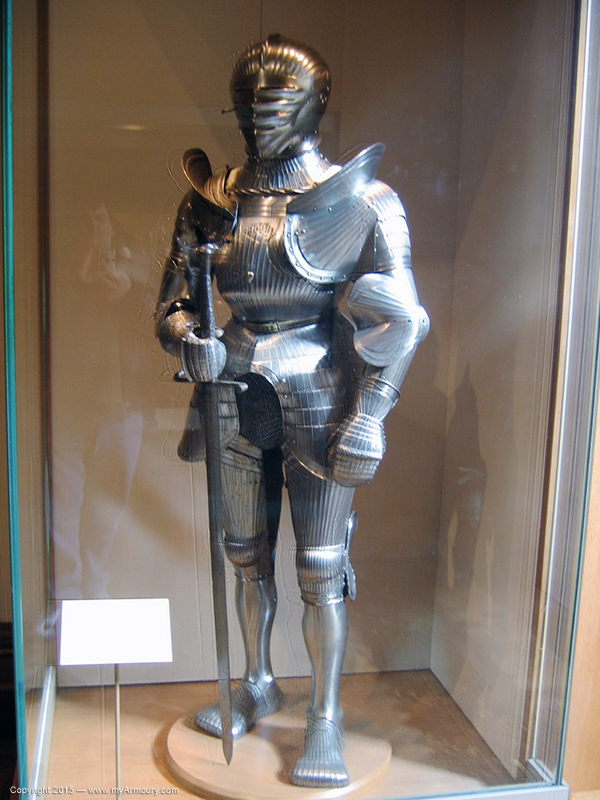 To the visitor's right (when entering the court from the main entrance) are the galleries of eastern arms and armour. This impressive collection features many harnesses and weapons from Japan, China, India, the Middle East and other non-European countries. 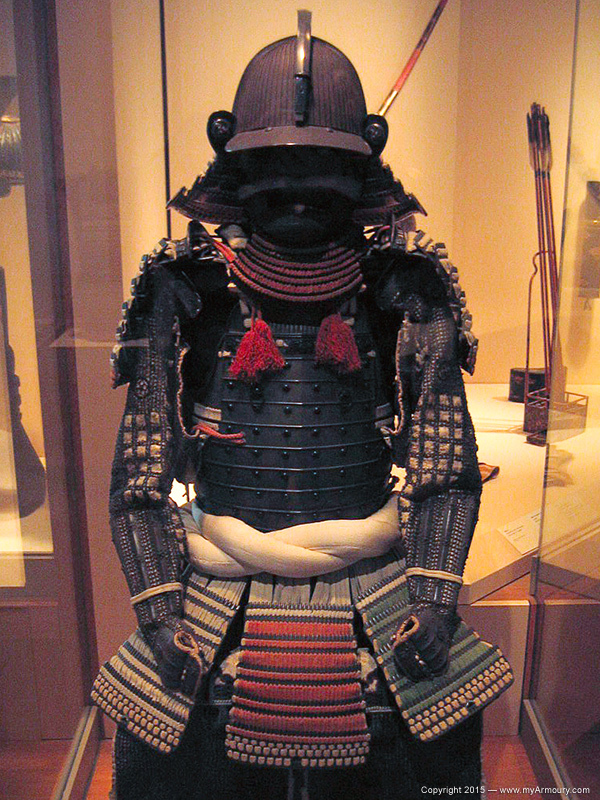 According to the museum, the collection of Japanese arms and armour is the "most comprehensive ever assembled outside Japan." The breadth of examples in this section was quite stunning. Though my own interests lie more in European studies, I was very impressed with this section. 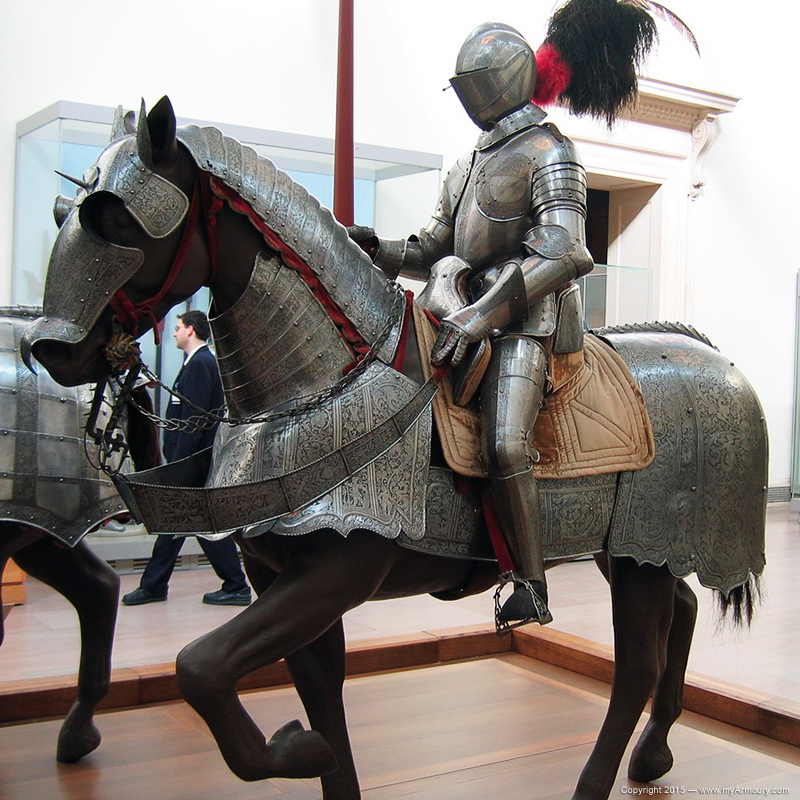 To the left of the Equestrian Court lie the rooms covering European arms and armour. 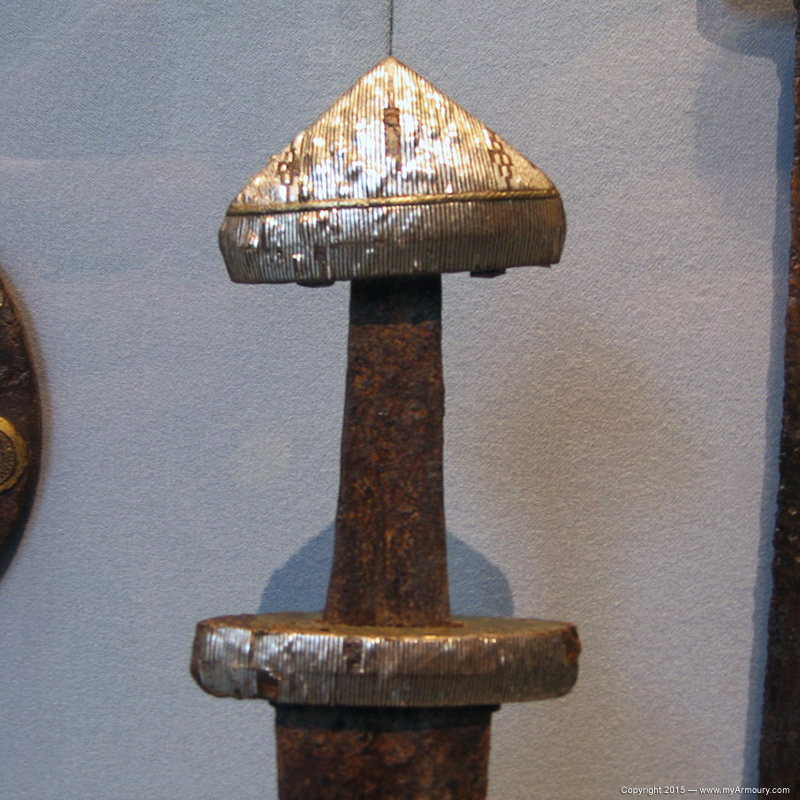 These are arranged roughly chronologically, beginning with a case featuring two Viking swords and a spangenhelm. 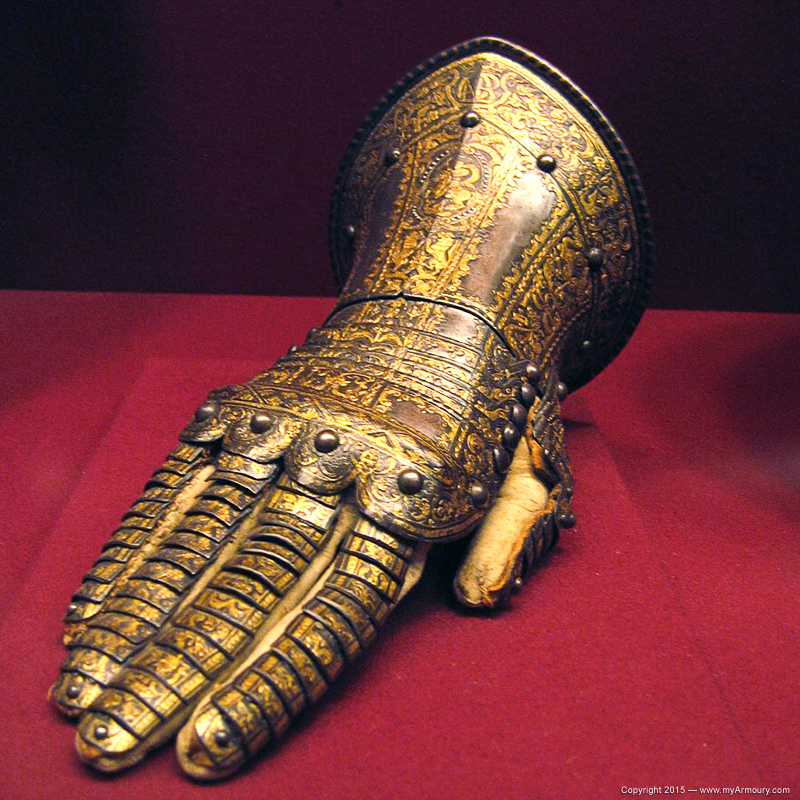 Apart from these and a few other items, the collection consists mainly of items from the 14th century and forward. 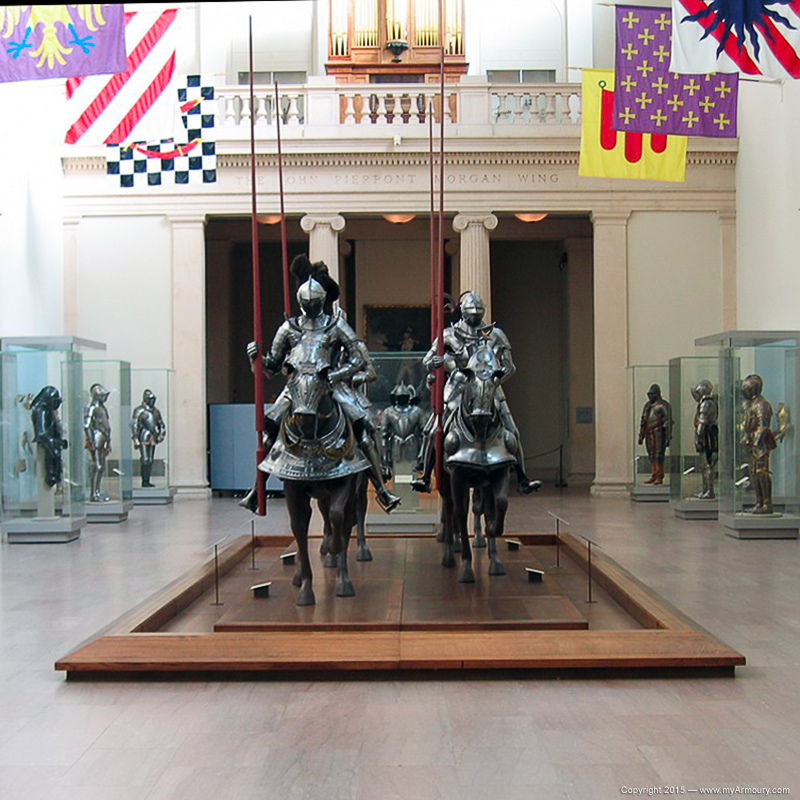 These wood-floored galleries and those for the non-European arms and armour are lit as I've come to expect from museums: that is somewhat dimly, especially compared to the brightly lit Equestrian Court. Viewing the collection is not difficult though glare gets cast on the glass cases, but anyone wishing to take pictures will likely waste some film trying to get good pictures. 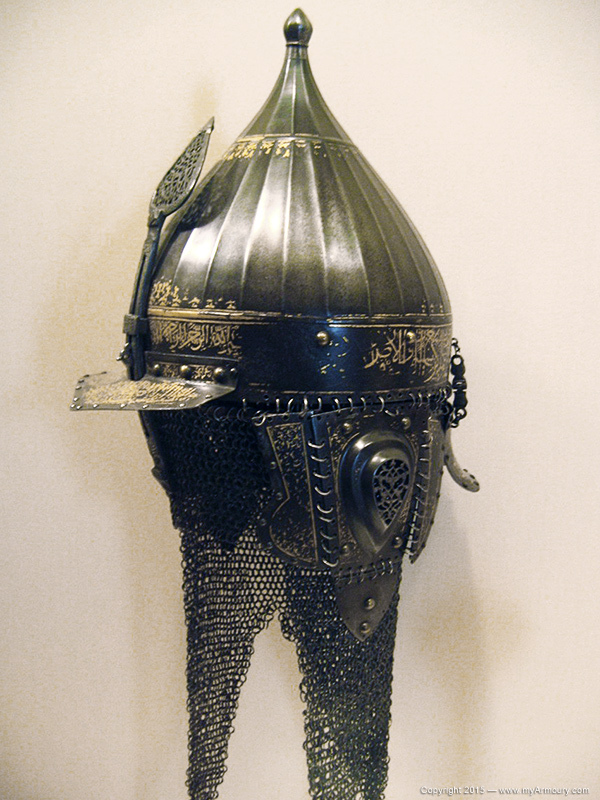 The Met's collection of European arms and armour is extensive. 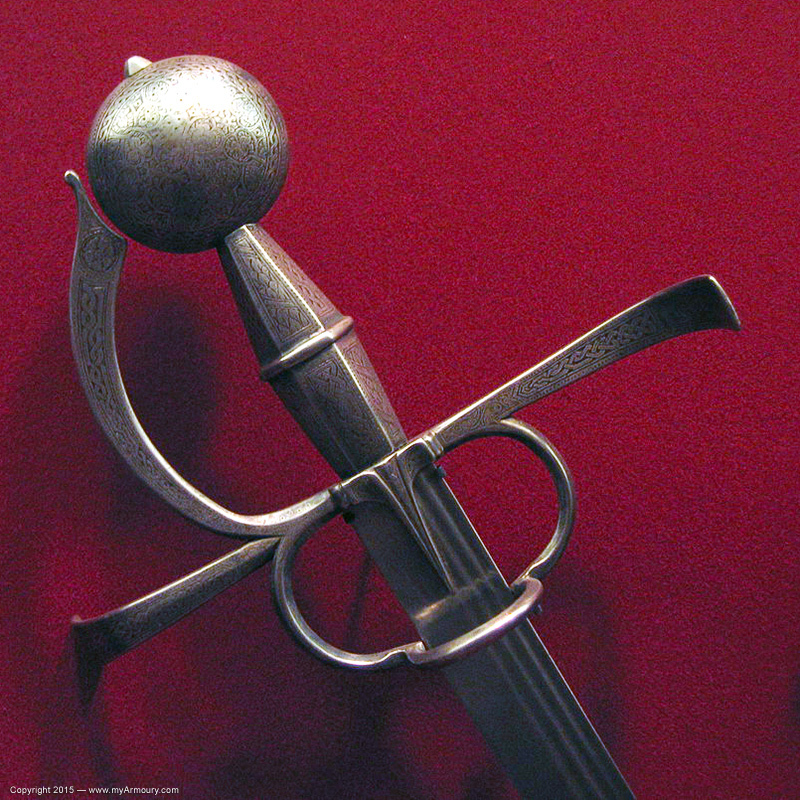 The gallery is filled with swords, daggers, helms, armour pieces, shields, crossbows, and more. 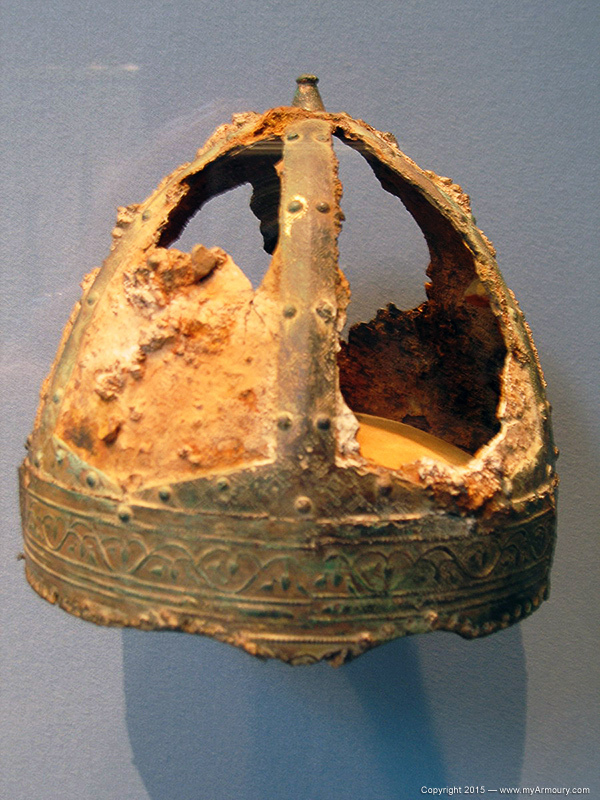 A few pieces are heavily corroded, but most are in good condition or better. Viewing these pieces in person was a joy. What is often lost when viewing these items in print is their size. 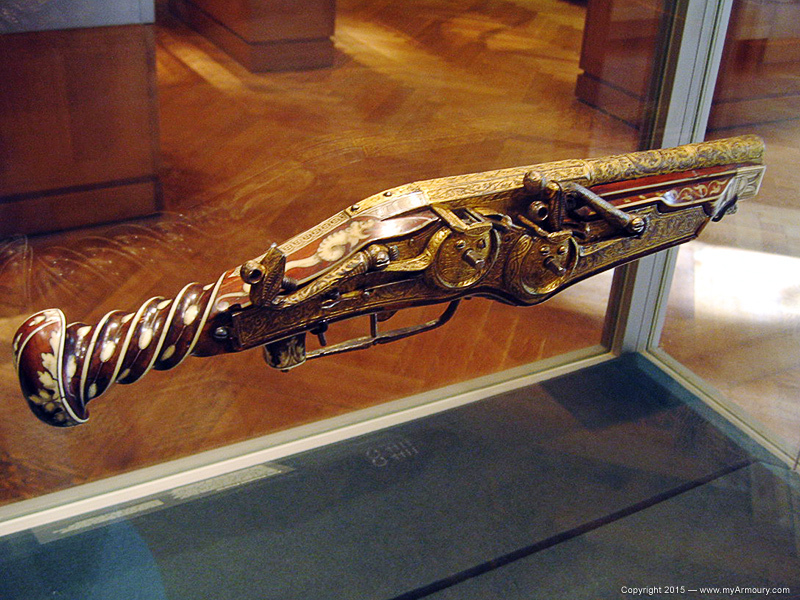 There is a larger variety of sizes to medieval and renaissance weapons than is often realized. 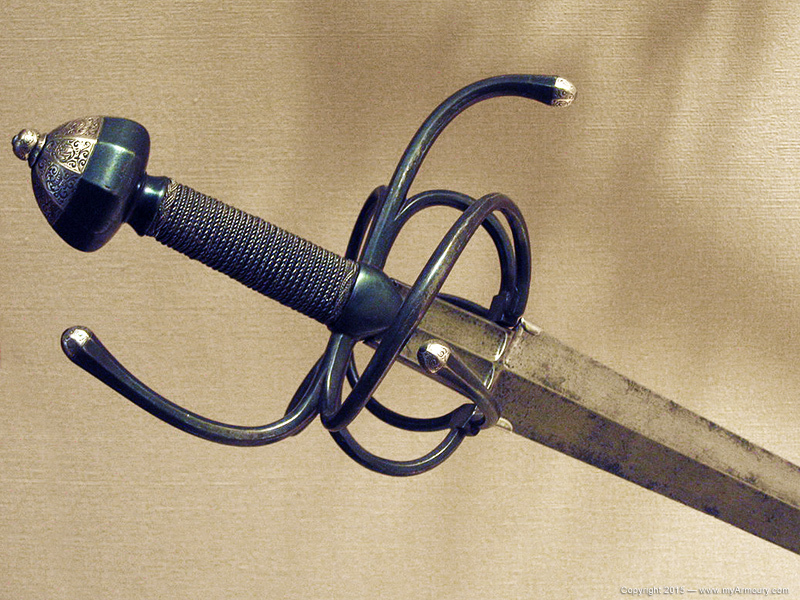 One sword in particular had a pommel that must have been nearly three inches across. Viewing these items in all three dimensions is a unique experience. It is impossible to fully describe the contents of these galleries. They simply must be seen to be fully appreciated. The high quality of the collection is impressive and many pieces will be familiar to visitors from arms and armour publications. 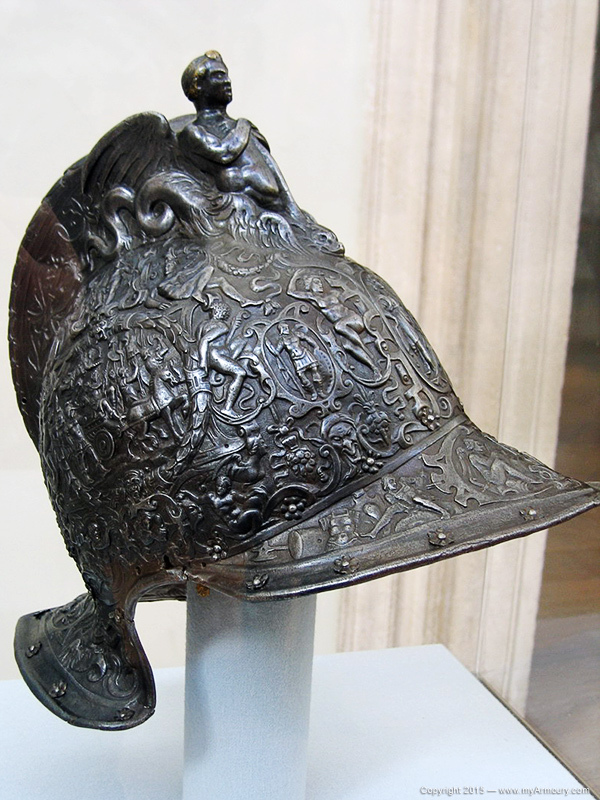 Armourers of such fame as the Negrolis and Helmschmids are represented in the armour galleries. 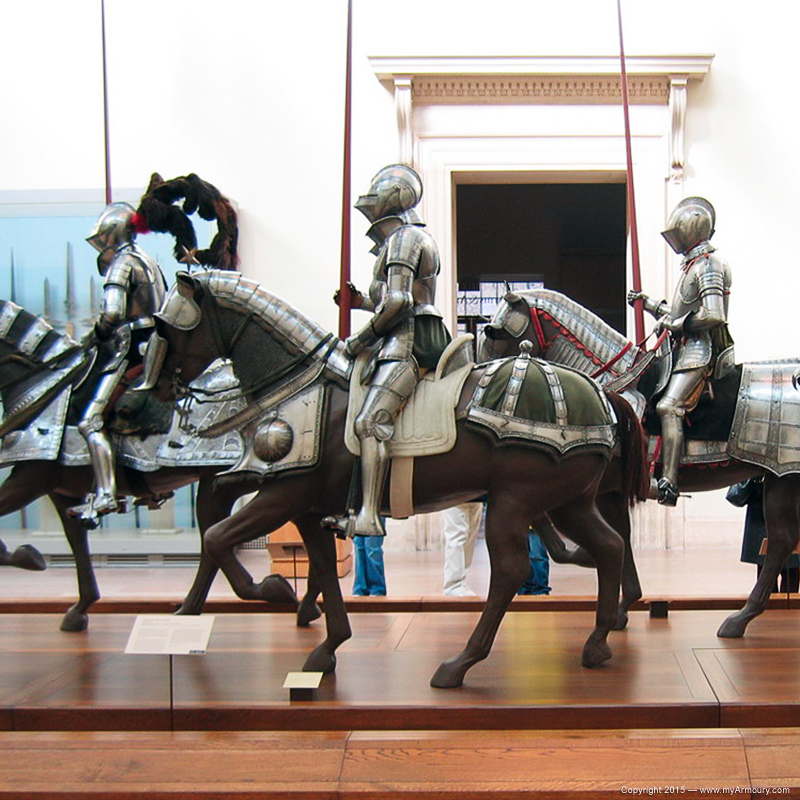 Tucked back in a corner during my visit was a special gallery, The Armored Horse in Europe 1480-1620. 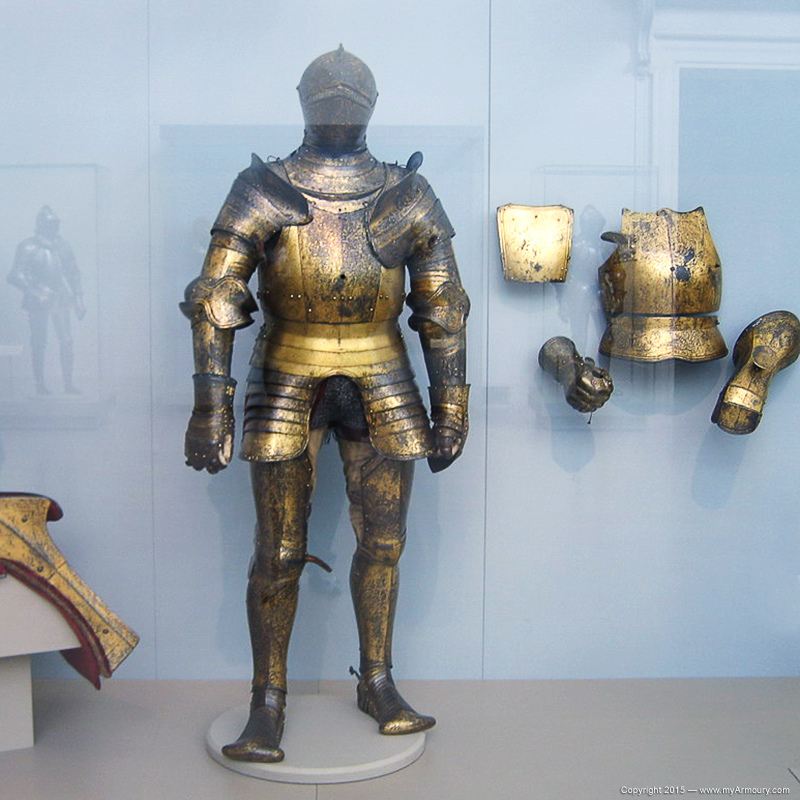 This gallery contained many fine examples of armour for horse, including a unique black and white chanfron. 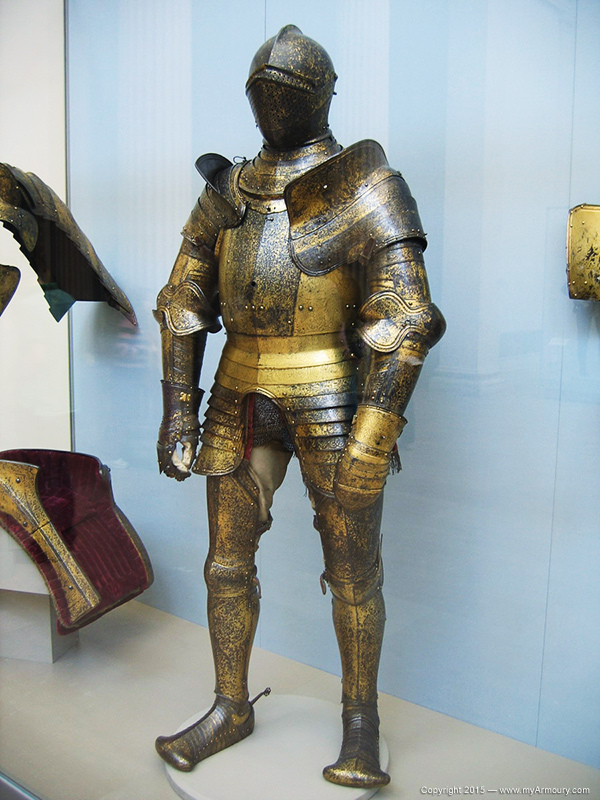 Visitors interested in arms and armour should not neglect the rest of the museum. 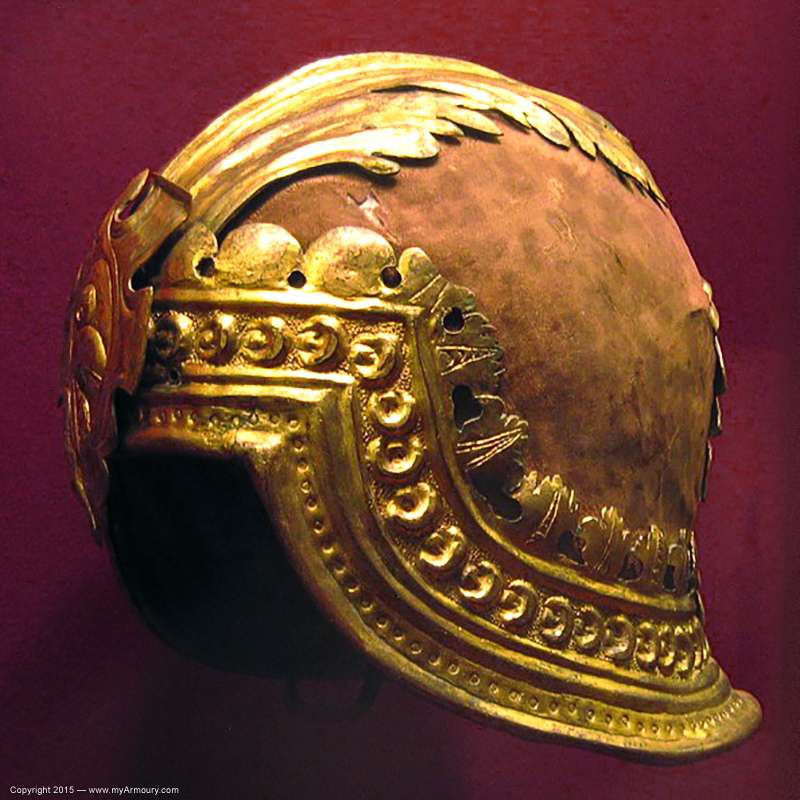 On the other side of the museum, the Greek and Roman galleries showcase bronze armour and two falcatas. 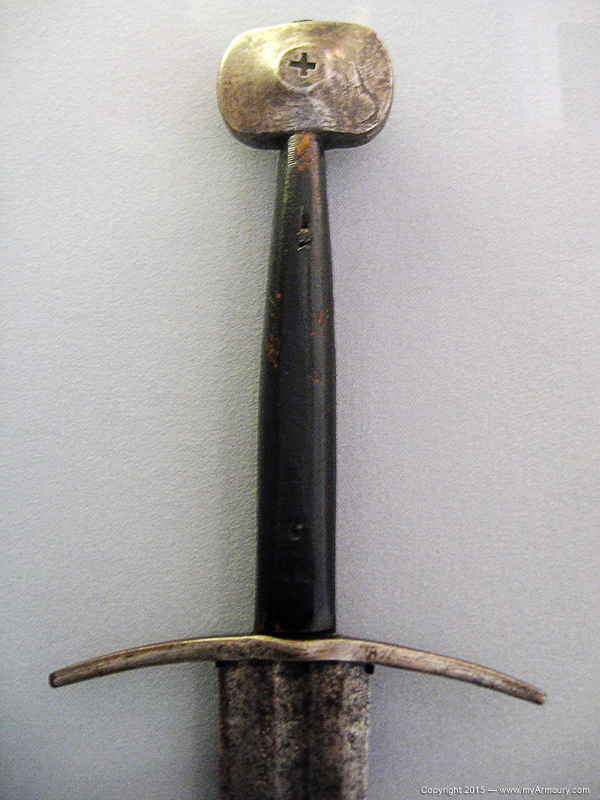 In the Medieval art galleries can be found two hunting knives attributed to Maximilian I's knife maker plus a unique ballock dagger and a landsknecht dagger. 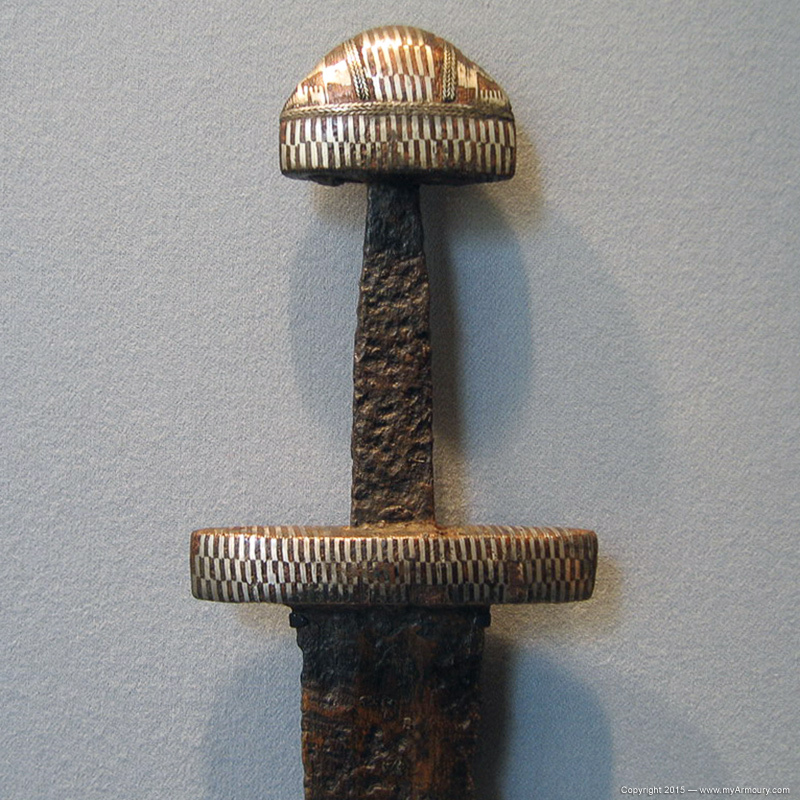 A section showcasing ancient art and jewelry contains a Celtic anthropomorphic sword/dagger and a few early iron spearheads. The Metropolitan Museum of Art is well-represented in print, with catalogues and guides dating back to the museum's founding. 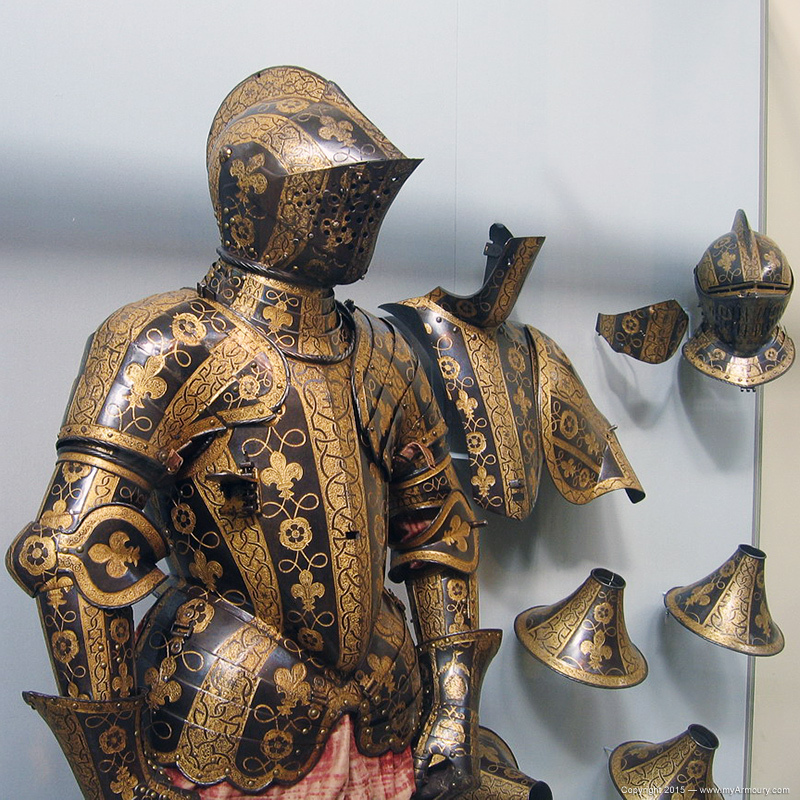 The arms and armour department has seen distinguished leadership, including Bashford Dean, Helmut Nickel, Stuart W. Pyhrr, and its current Curator in Charge, Pierre Terjanian. These gentlemen have authored or helped author many books on the subject as well as books on the Met's collection and special galleries. The museum's main gift shop contains all the knick-knacks and souvenirs one would expect. 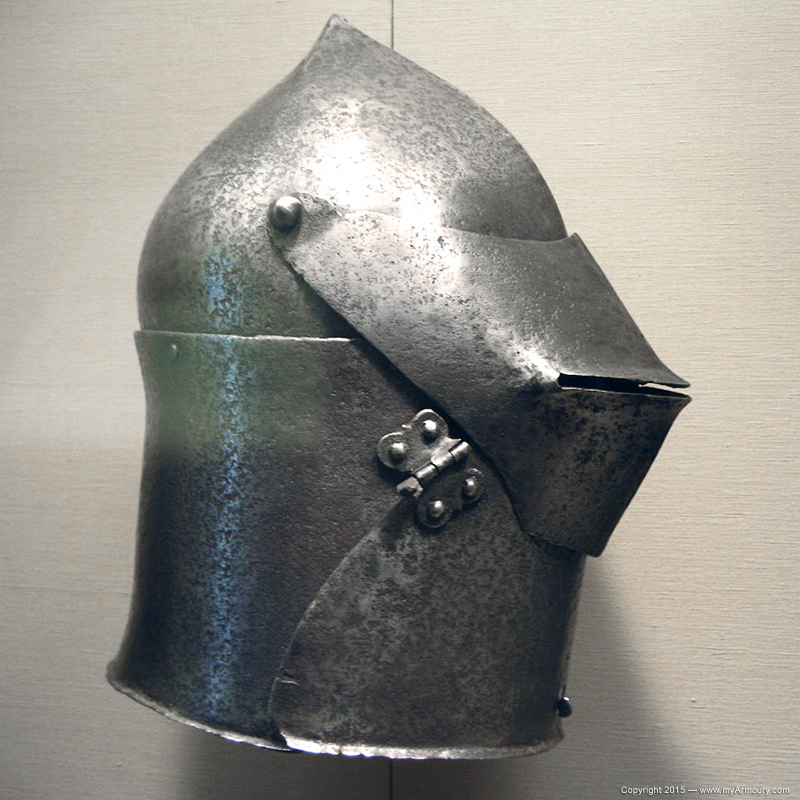 In addition, though, the shop contained many of the recent publications from the arms and armour department as well as a number of other quality books on arms and armour and medieval history. 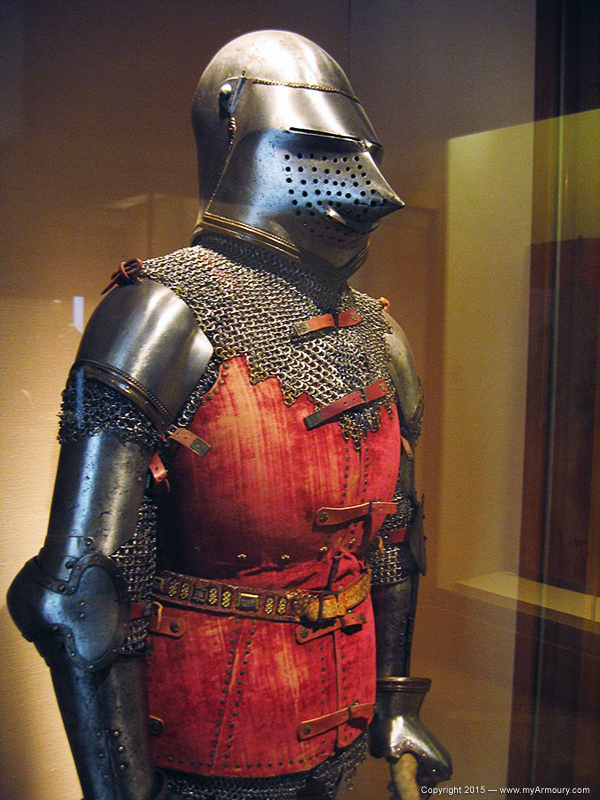 Recent publications like Arms and Armor: Notable Acquisitions 1991-2002, The Armored Horse in Europe 1480-1620 (a catalogue of the exhibition noted above), and Heroic Armor of the Italian Renaissance Filippo Negroli and His Contemporaries are for sale alongside Ewart Oakeshott's Records of the Medieval Sword and publications from the The Royal Armouries, Leeds. These publications even seem reasonably priced, something not always sees at many tourist destinations. The museum gift shop has recently added the wonderful new books published by Hans Prunner Editore to its impressive lineup of offerings. 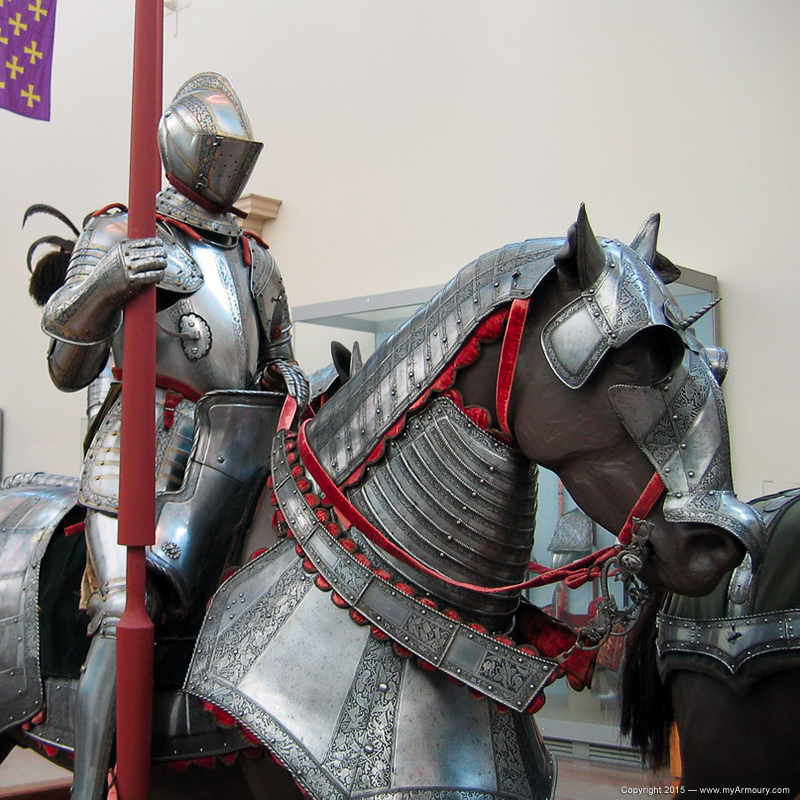 The museum houses much more than arms and armour, and visitors should try to take enough time to experience all the various offerings. 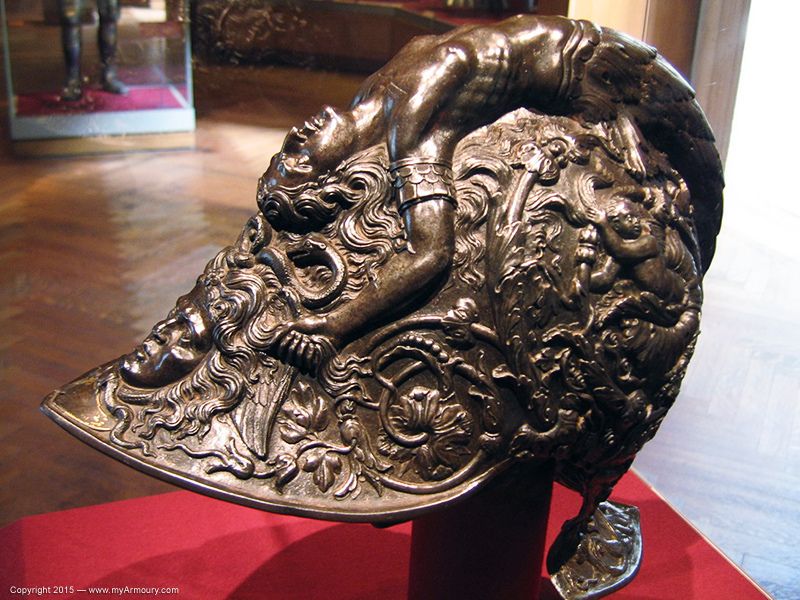 Anyone with an interest in history or art will enjoy the visit, as there is so much to offer. Art and artifacts from many cultures pack the floors. I had the chance to view a special exhibition, Set in Stone: The Face in Medieval Sculpture, and was quite impressed. 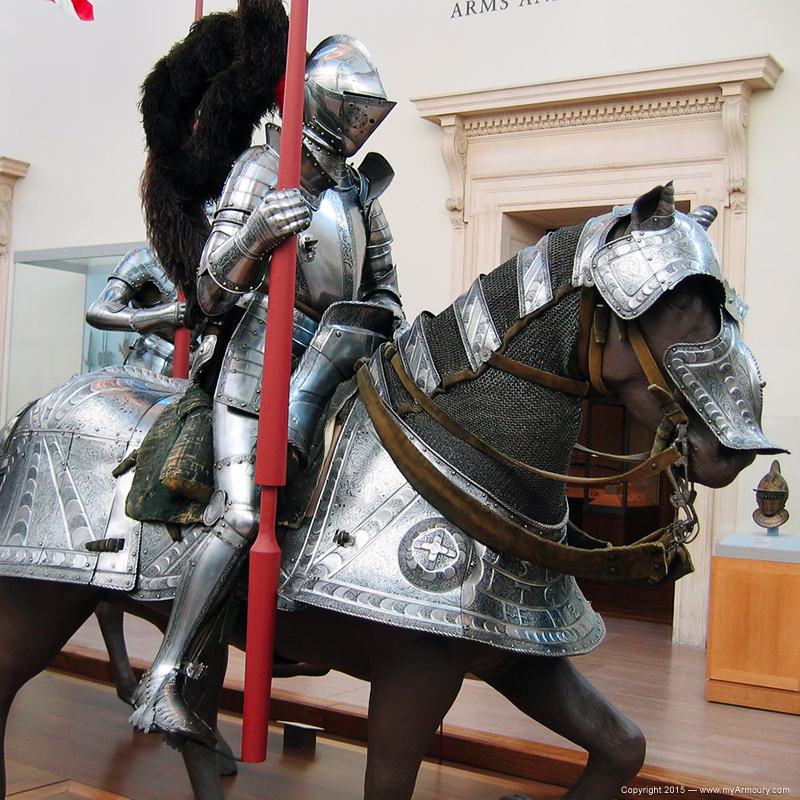 Arms and armour enthusiasts should do everything in their power to visit The Metropolitan Museum of Art if they find themselves in the area. Its collection is large and varied, and filled with important, high-quality items. These items are easily viewable and their personal photography policy is liberal. On top of this, the museum is centrally located in Manhattan and easy to find. If visiting on a nice day, New York City's Central Park can be fully enjoyed as it is located behind and around the Met. 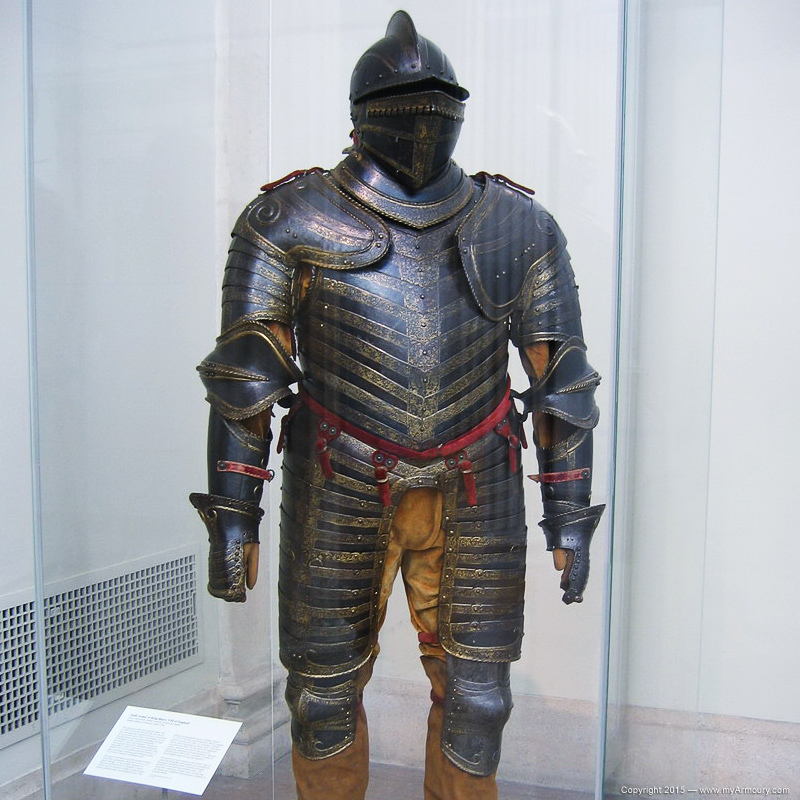 There are not too many high-quality arms and armour collection in the United States. The Met is perhaps the crown jewel of them all. 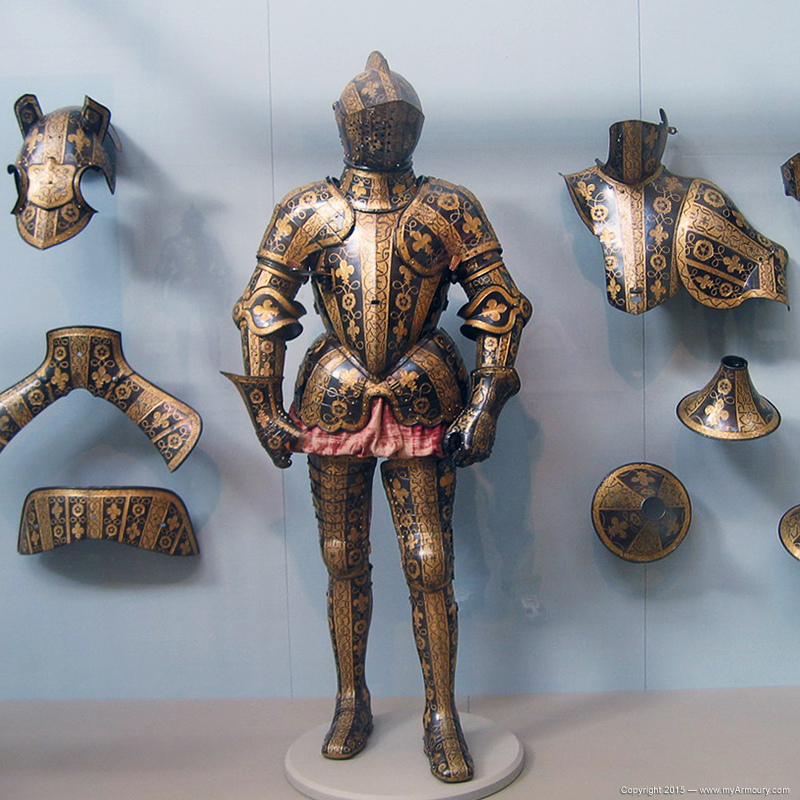 Its collections should please both the arms and armour lover and any family members and friends sharing the visit. Chad Arnow is a classical musician from the greater Cincinnati area and has had an interest in military history for many years. 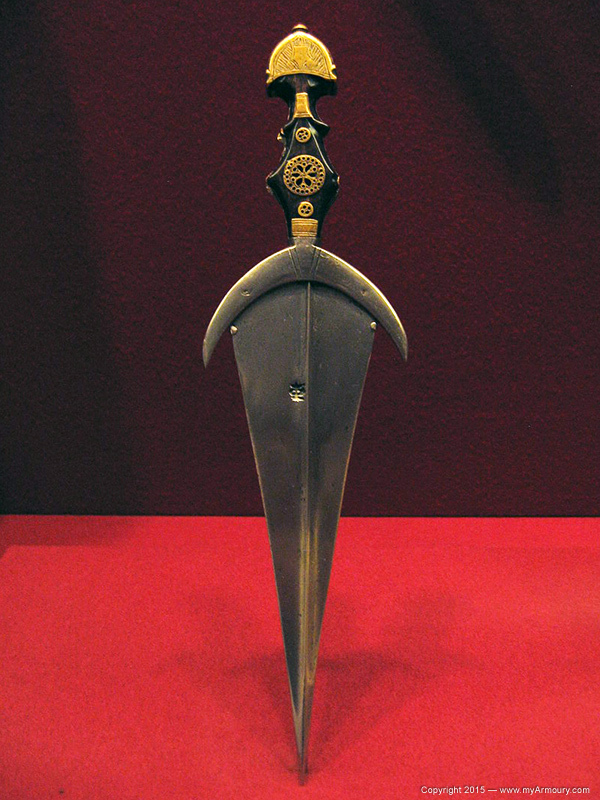 Though his collecting tends to focus on European weapons and armour of the High Middle Ages, he enjoys swords, knives and armour from many eras. Additional photos can be viewed in our Metropolitan Museum of Art photo album.